In the 25 years that I have been visiting Aviemore, the size of the Scottish Highlands town and the volume of people that stroll the streets has vastly increased. Some might say that this has been to the detriment of the attractiveness of the settlement, located in the naturally beautiful Cairngorms National Park. Certainly, the modern housing estates that sprawl to the north of Aviemore do it few architectural favours and the pubs, cafés, restaurants and shops are often full to bursting with visitors. But I like the busy, yet relaxed and friendly, atmosphere of the outdoors town. It is always heartening to see – and hear – the enthusiasm of so many up-beat, whatever-the-weather walking, climbing, cycling and skiing fans. I have witnessed, too, a growing number of holidaying families and young couples, which makes Aviemore feel like a trendy place to be. The history of Aviemore is fascinating and dates back many thousands of years. A stone circle, the Aviemore Ring Cairn, is believed to be some 4,400 years old although no-one is sure of its purpose. Perhaps, it was a burial area or a place to celebrate the winter solstice. The circle can be viewed by following signposts from the Main Street. And so began the development of the outdoors town as we see it today. 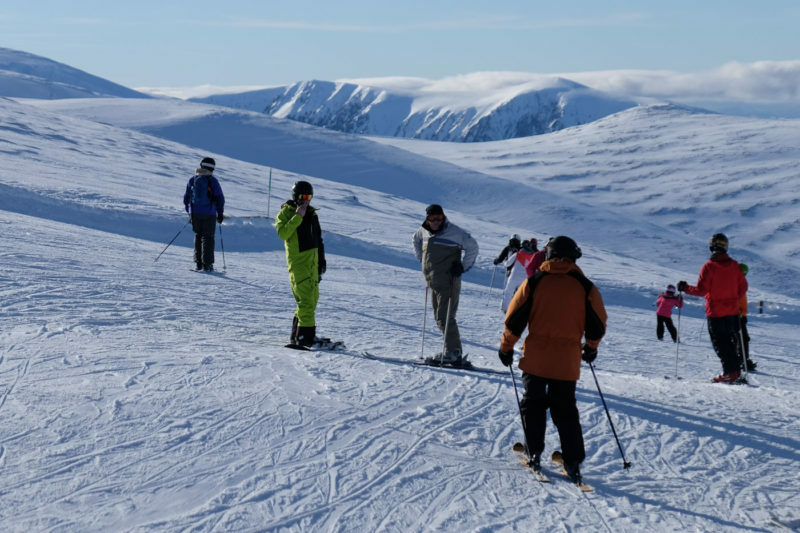 In the 1960s, another major boost to Aviemore came by way of the establishment of the nearby ski area, Cairngorm Mountain, which is one of five skiing resorts in Scotland. These days, Aviemore boasts an impressive range of facilities including a wide variety of accommodation, from hostels and bunk houses to smart hotels, supermarkets, a big selection of outdoors shops, a popular swimming pool complex attached to one of the hotels but open to non-residents, a leisure centre with gym, cinema, schools and an outpost of the University of the Highlands and Islands. The places to eat out are numerous, with some of my favourite destinations being the Happy Haggis Fish and Chip Shop when we have arrived in the town late and need a big meal to fuel the next day’s hiking; the Cairngorm Hotel for reliable good food amid what always appears to be organised mayhem although rarely with a hitch; and the Old Bridge Inn, which has now moved its menu rather more up-market. If you don’t fancy main course prices of around £17 (although the food is beautifully cooked and presented), it’s well worth stopping in for an early evening pint alongside the many tired and contented outdoorsy folks – and their plentiful, equally exhausted, dogs. A mid-afternoon cake and coffee stop might take me to the Mountain Café or the Druie along the road at Coylumbridge, although there are many others to choose from if you can’t find a seat, including new kid on the block the Route 7 Cafe. Another must is a cup of tea and cake, or something more, in the Ptarmigan Restaurant, located more than 3,500ft above sea level on the UK’s sixth tallest mountain, Cairn Gorm. The Ptarmigan is accessed at Cairngorm Mountain via Scotland’s only funicular railway, which whizzes passengers from the base station to the top station. I recommend you take the time to enjoy the break-taking panorama from a nearby viewing platform before heading into the warming high-rise restaurant. When the snow comes, the funicular is used by skiers and snowboarders to reach an area extending to 20 miles of pisted slopes and including 20 runs graded for different abilities. In the summer months, there are a number of guided walks that start from the Top Station, including a chance to reach the very summit at 1,245m. It should be noted that you are not allowed to get the train uphill and then walk down, although you can walk up and use the funicular to descend. The rules allow for the best conservation of flora and fauna on the mountain slopes. 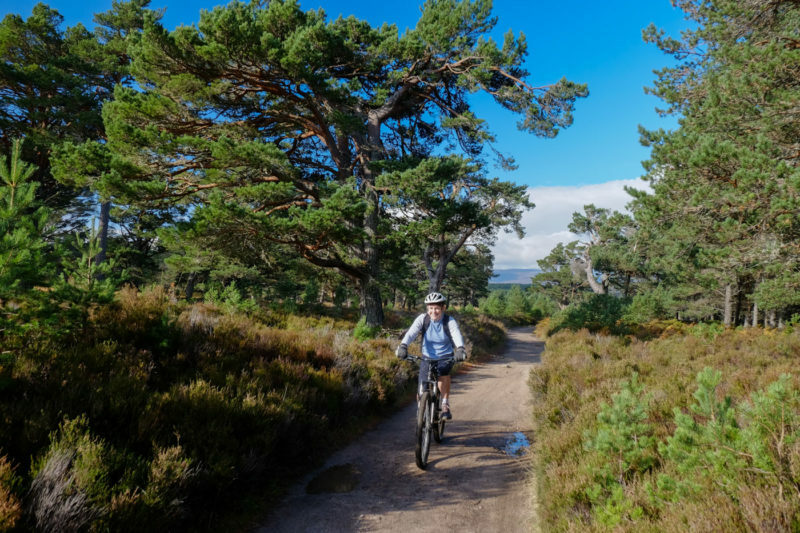 It doesn’t matter how many times you visit Aviemore, you’ll always find a new route to walk or cycle or another activity to try right on the town’s doorstep. 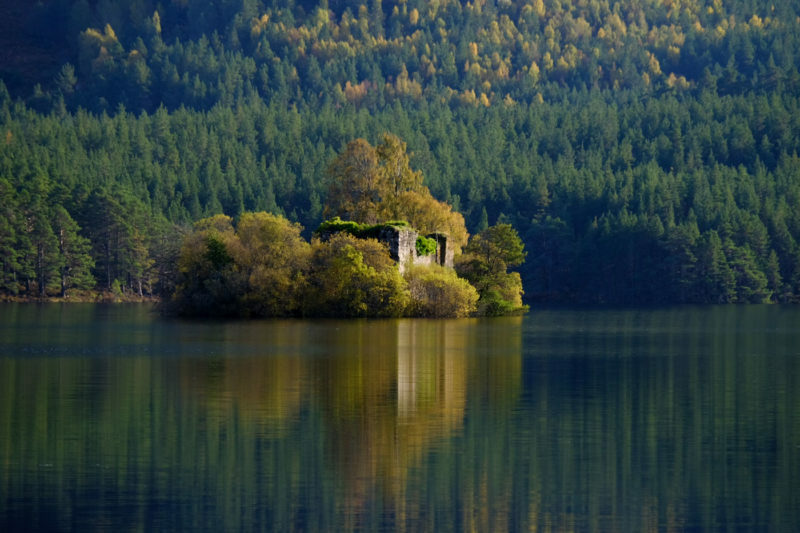 If you are looking for ideas of things to do, or tuition in new adventure sports, a popular destination, especially for families, is Rothiemurchus estate. You can try pony trekking, fishing, Segway tours, archery, wildlife watching, quad bikes and enjoy a Treezone Aerial Adventure. There are also many miles of waymarked walking and off-road cycling trails and paths through the estate’s large forest. A gem of a route follows a path around picturesque Loch an Eilein with its ruined island castle. Nearby Loch Morlich surprises with an expanse of sandy beach situated between waters and forest. The loch has a watersports centre where there are opportunities to learn to kayak, sail, windsurf and give Canadian canoeing and stand-up paddle surfing a go. Another somewhat surprising discovery is the Cairngorm Reindeer Centre, to the east of Loch Morlich. 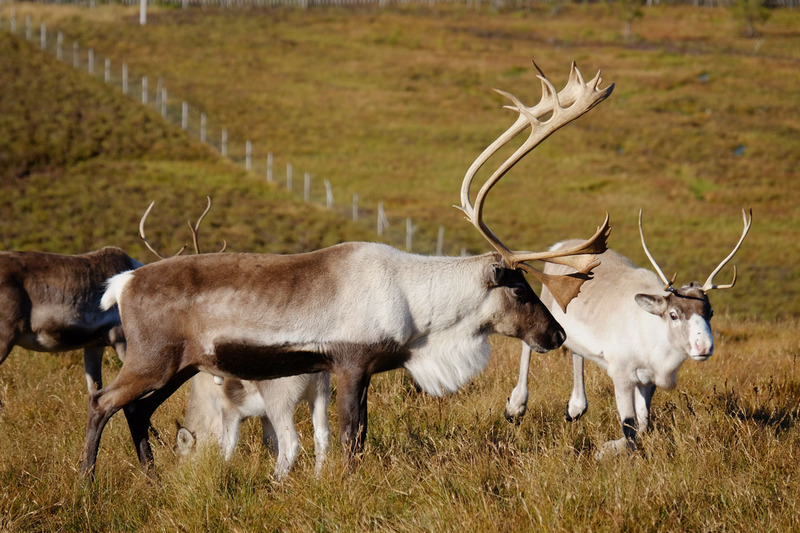 Young visitors might like to join a short guided hill walk to see Britain’s only free-ranging herd of reindeers. Another attraction, in particular for families, is the Strathspey Railway heritage steam train between Aviemore, Boat of Garten and Broomhill. Formerly the Highland Railway Line, the route was brought back to life in 1978 thanks to a dedicated volunteer group. The 10-mile section takes passengers on a journey back in time and reveals captivating views of the countryside. Several times I’ve enjoyed a steam train ride with friends before alighting at Boat of Garten to stroll or cycle back to Aviemore on a waymarked long-distance walking trail, the Speyside Way. It makes a great half-day mini adventure that combines history, the fun of a steam train ride and the fitness benefit of a walk or ride. Many outdoors fans will also be familiar with another great Aviemore institution, Scotland’s National Outdoor Training Centre, Glenmore Lodge. The centre, 70 years old in 2018, is acclaimed for a programme of education and training in adventure sports, including navigation, winter mountain skills, mountain biking and ski touring. There is also now a wide range of independent activity providers based in the area. 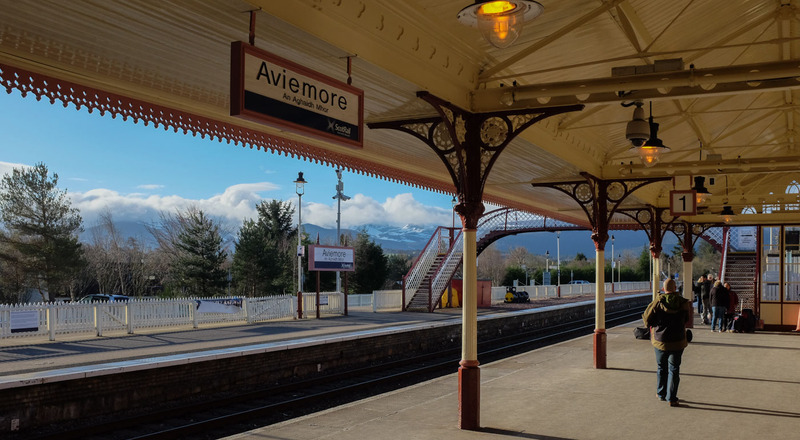 For those who enjoy wilder and more remote adventures, Aviemore is ideally located at the foot of the huge Cairngorm mountain range. The massif comprises a large elevated plateau dotted with with rounded mountains formed by glaciers millions of years ago. Five of Scotland’s six tallest mountains can be hiked including Cairn Gorm itself, Ben Macdui, Braeriach, Cairn Toul and Sgor an Lochain Uaine. 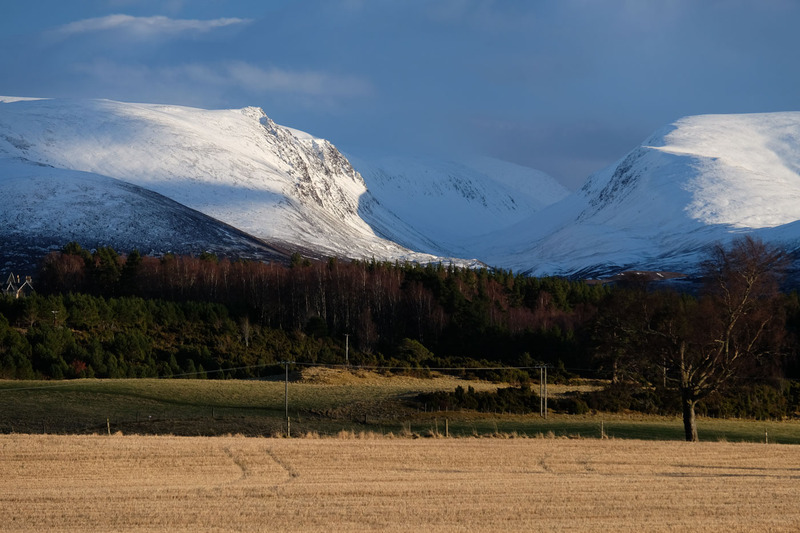 As you might imagine there are plenty of Scotland’s Munros, including those five highest summits, and Corbetts that are located close enough to Aviemore for a meal and a pint after your hike. I have great memories of many mountain outings when visiting Aviemore. My first ever ski touring expedition visited two great summits, Cairn Gorm and Ben Macdui. My partner Gordie and I were fortunate to have a skilled skier as our guide and we very much enjoyed the amazing sense of freedom to ski where we wished surrounded as far as we the ye could see by fabulous views of numerous snow-capped mountains. I confess I was exhausted by the end although deeply satisfied. Trying a new sport and skiing more than 12 miles and some 1000m of uphill and downhill left me with legs so wobbly that I keeled over just 50 metres before we reached the car! 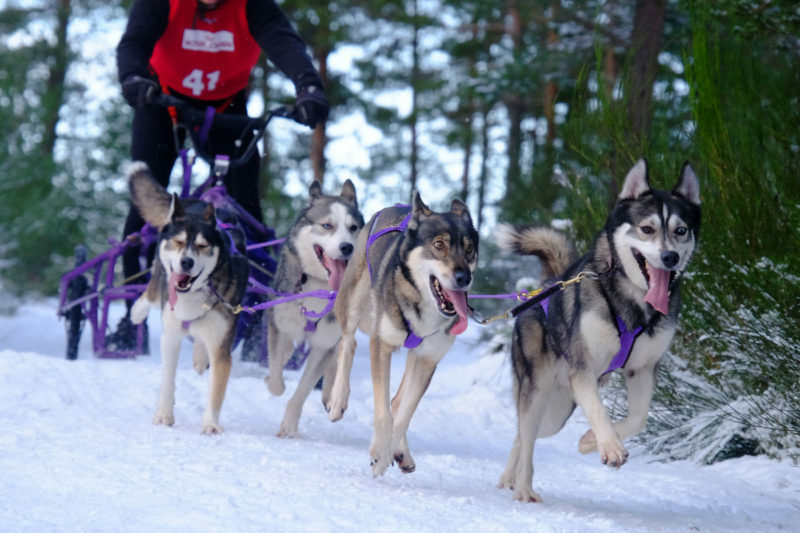 From an original of only 12 teams, the Aviemore Sled Dog Rally is now the largest event of its kind in the UK, with over 1,000 sled dogs and 250 mushers. Another challenging but highly rewarding adventure was to mountain bike a classic route known as The Burma Road. The hardest part comes early in the 25-mile ride, with a severe and sustained uphill push – I don’t mind admitting I got off my mountain bike to hike for some of this – to a height of almost 700m. The rest of the route is undulating on a terrain mix of tarmac, trail and rocky tracks and with many great viewpoints over the scenic Cairngorms. Recently, too, I described Bynack More as “possibly the most perfect Munro” following a superb winter’s hike. A short mountain bike ride from the road near Glenmore Lodge took Gordie and I past magical An Lochan Uaine – the “Green Lochan” – to a foot bridge where we left our bikes and hiked the rest of the way to the 1090m summit. We marvelled at the well-trodden path, the never-too-steep ascent and our first snowy boot prints of the season. Wispa the Wonder Whippet was delighted to be allowed off-lead for the entire route. While I have visited Aviemore more times than I can recall I still have plenty more trips planned. I have a cluster of seven Munros still to hike to the south-east of the town to complete my first round. 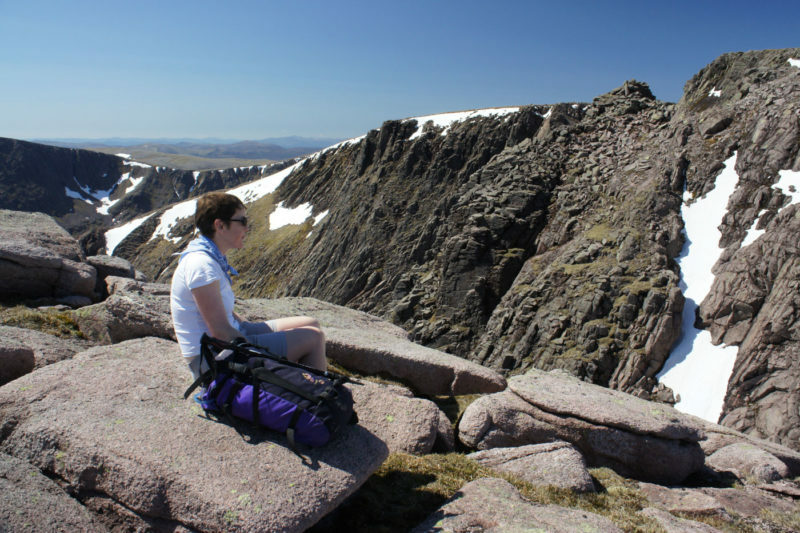 I am also keen to walk one of Scotland’s best-known hill passes, the Lairig Ghru. As I make a few New Year’s resolutions, I have placed this apparently wild but fabulous 19-mile route through the central Cairngorms in the top five must-dos for 2018. I have no doubt I will be in need of the warm hospitality of an Aviemore hotel or pub both before and after this adventure.